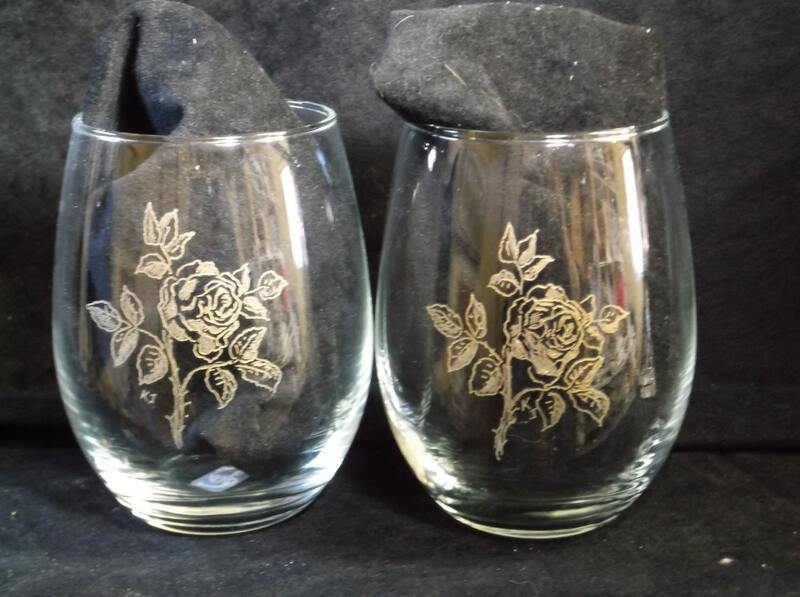 Set of 2 stemless wine glasses engraved with roses. I have filled the etching with a gold filler that enhances the beauty of the etching. Because of the gold filler we recommend that they be washed by hand. These are all hand engraved with a high speed drill. Because they are hand engraved each glass engraved will vary slightly. All are signed. Great gift for the people in your life that enjoy a little wine and enjoy the beauty of flowers and art. All items must be paid for before we start custom making your item. Once we have begun a custom personalized product there is no cancellation. We ship USPS unless the order is very heavy such as multiple rocks going to one address, then UPS or FedEx would be better. When we ship we try to send you the tracking #, We try to ship within 3-5 business days after your final approval for custom work. We are not responsible for USPS delivery. There are no refunds. If we make a mistake on your order we will replace that item to you at no cost. We are not responsible if you provide us with the wrong spelling and/or date or other wrong information.. We make every effort to send you the item just as you wanted. If you order multiple items of the same item, contact us for a discount price. Ex. 20 family reunion shirts would receive a discount.